Well we finished off our last day in Brisbane looking around the art galleries and science museum at South Bank. These were all free to enter and had some fascinating and beautiful pieces. My favourite part was the spider and snake section in the science museum where you could take a closer look at the different kinds of species found in Australia. 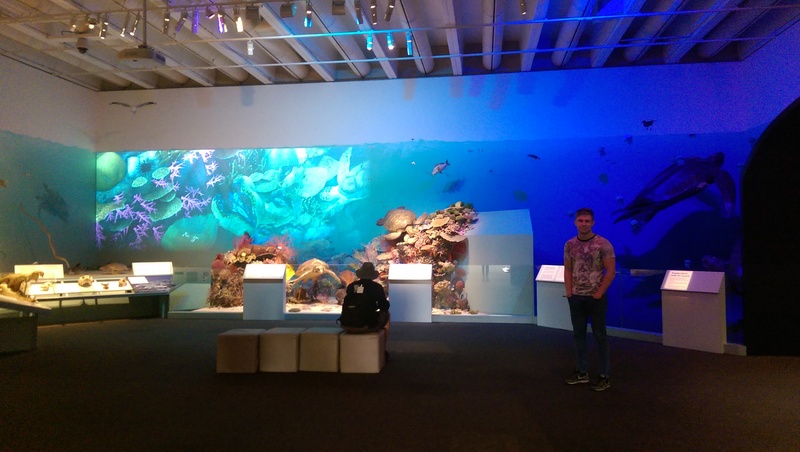 Mark’s favourite part was this wonderful display on the Great Barrier Reef that got us very excited to explore it for real. It is old and temperamental, it has a DVD player which is sticky and likes to fall on our heads, it is automatic so the handbrake and indicators are on the opposite side to what we are used to, it struggles up hills, the fridge is a bit rubbish….. but we are learning to love our colourful campervan! The first trip that we took it on was to the Tambourine Mountains south of Brisbane. Mark drove, I was being a wus. We got lost (the first of many times). 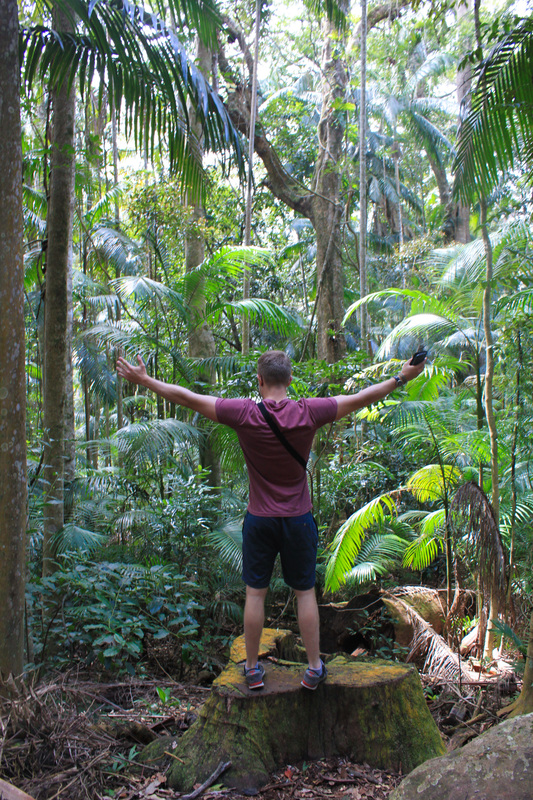 But eventually we found ourselves up the mountain and at one of the rainforest walks around this beautiful national park. 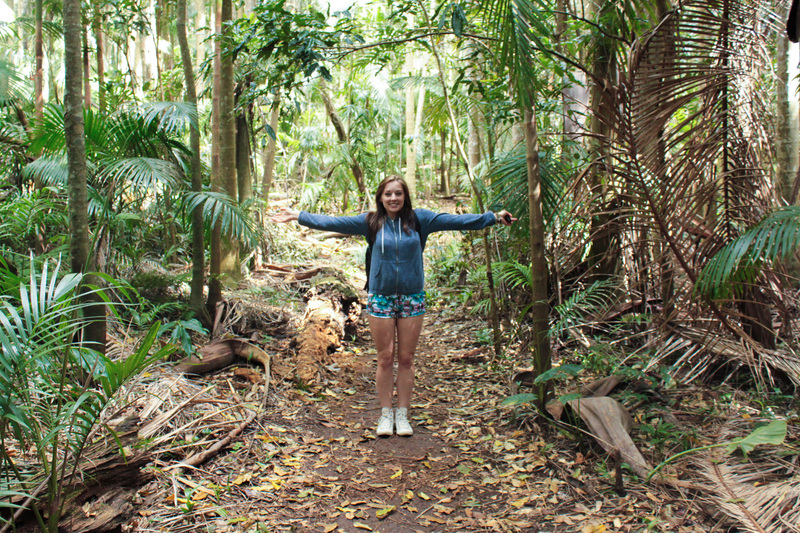 We got eaten by insects (note to self, must buy bug repellent) but it was definitely worth it. At one point we thought that we stumbled across some amazing, rare wildlife as a strange looking bird crept out of the bushes. As we later learnt, this was in fact a Bush Turkey. Not rare. They are literally EVERYWHERE, outside the local stores, in the carparks, running across the road, in all the forests, on the beach. You step outside (or even inside for that matter) on the East Coast and you will see one. But it was a fascinating walk none the less. So next stop was Byron Bay where we stayed for 3 nights. It was a quaint, hippy, chilled out town, miles away from the busy bustle of the city. Our time in Byron was jam packed with beach trips, amazing ‘award-winning’ beer, live music and one very rainy evening which gave us an excuse to chill out (and fall asleep) in a lounge style cinema. We have a short video of some cool country music that we stumbled across at the Railway Bar. We will try and upload this when we figure out how to do so! 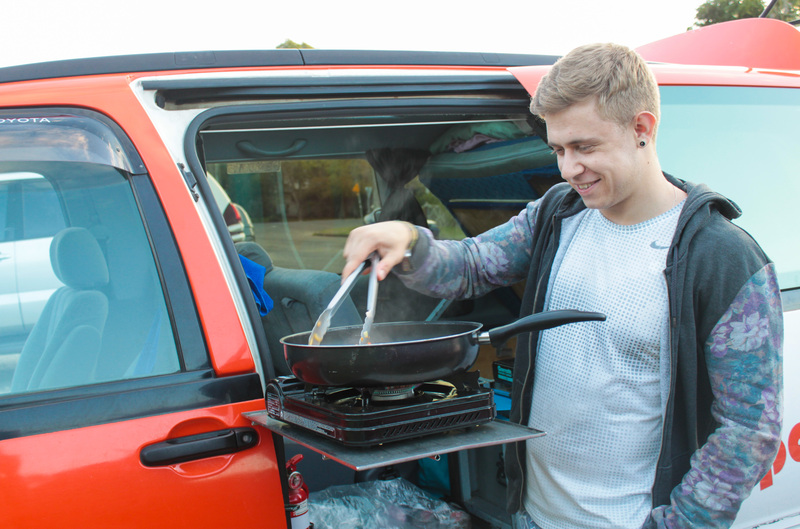 Before heading off on the road again we cooked up a tasty feast of noodles and veg (saving money so no meat for us, veggie for the evening!). 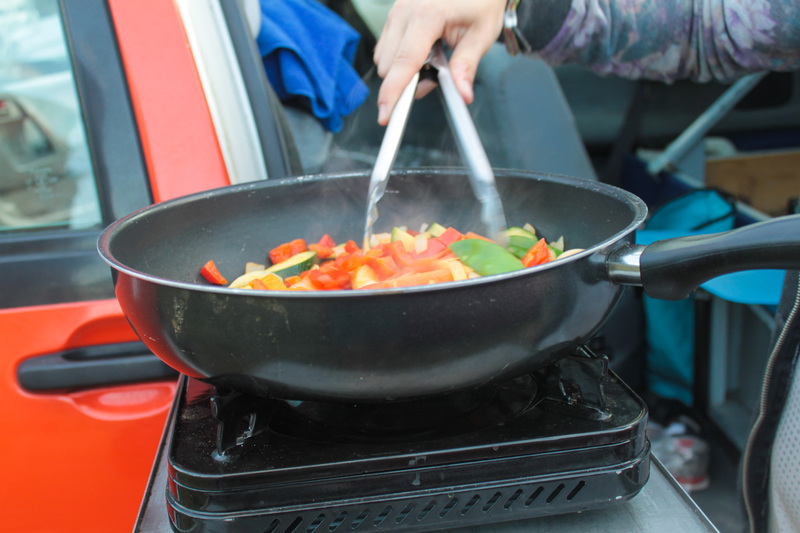 The cooking facilities in the van proved pretty handy, with a powerful gas stove, lots of cooking utensils and a little table. So we hired the van for a total of 4 weeks in order to travel up the East Coast from Byron to Cairns, stopping at various locations along the way. So far we have been going for a week and along with Tambourine and Byron we have been to Burleigh Heads, Surfers Paradise, The Glass House Mountains. We are currently residing in Noosa where we found our beloved WiFi, so we shall do a second road trip post soon to tell you all about it!